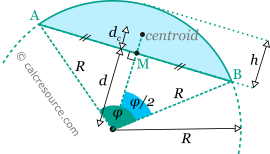 This tool calculates the basic geometric properties of a circular segment. 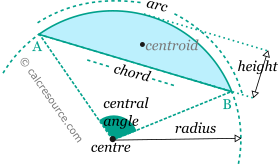 Enter below the circle radius R and either one of: central angle φ or height h or distance d. Note, that the angle φ can be greater than 180° which represents a segment bigger than the semicircle. In that case distance d is negative and height h is bigger than R. The calculated results will have the same units as your input. Please use consistent units for any input. where L the arc length and LAB the chord length. 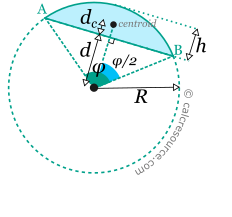 where d the distance of the chord from the centre.